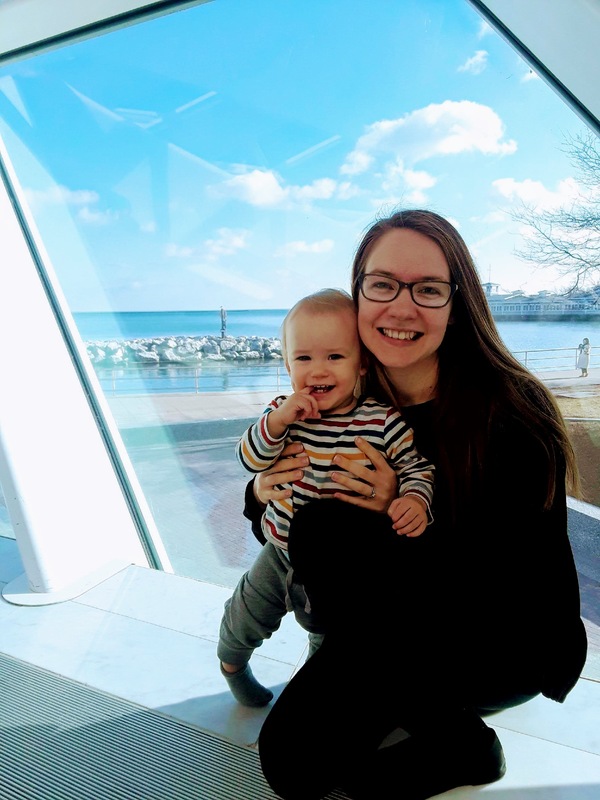 Since I shared in intense detail the overwhelming experience of mothering a newborn, I thought I’d share a peek into a much more rewarding time of motherhood. I might be the only mom on earth who never wants to go back to the newborn stage. Yeah, itty bitty babies are the cutest, but I can’t function without sleep or with a nonexistent schedule, and I struggled with the limitations of an immobile baby. And newborns are hard, because they demand so much without responding. Now that e.e. smiles and babbles and pulls his version of practical jokes on me, I finally can feel a connection. And now that I get enough sleep every night, I actually do feel it. I love our mornings together. He wakes up somewhere between 4:30-6:00 AM for a morning feed. I gave up trying to designate a specific wake time, but I put him back to sleep if he wakes up before six. We hang out in bed, whispering, playing peek-a-boo with the covers, and annoying Daddy who valiantly sleeps in until past seven. We chat and giggle, and he scratches my face and pulls my hair and steps in my eye. That, and finally admitting that it’s a reasonable time to get out of bed, gets me up. I throw on a robe and make my coffee. Caffeine doesn’t make a difference to me, but I like the ritual of something sweet and warm every morning (no black coffee for me!). Plus, coffee draws me into the kitchen and motivates me to make breakfast. Whether or not I actually make breakfast depends on if he slept through the whole night or woke fitfully every two hours from teething pain. Since he still gets all his nutrition from breastmilk, I’m not as rigid about regular meals. And I rarely eat breakfast myself. I know. Bad mom. I’m just so slow in the morning, and I hate cooking. To accommodate my lack of cooking motivation, I’ve got his breakfast routine down to a simple formula of grains, berries, and fruit. Normally I make porridge fingers or banana pancakes ahead of time and just toss one in the microwave each morning. That way I only have to muster up the energy to cook once every two weeks or so. Then I cut up some sort of berry and fruit (banana or clementine, usually, though I bought plums this week). I drink my coffee at the table and toss food onto his tray while he feeds himself. We started baby-led weaning (a UK term for eating solids) at six months old. Once we got over the initial terror of choking (which he’s never done), it was smooth sailing. I love baby-led weaning — less cooking, more time eating my own food, and great entertainment. e.e. has developed quite a diverse and demanding appetite. He eats anything, and anytime he sees anybody else eating something, he protests loudly until the person in question caves. Not unlike a begging puppy, actually. His pincer skills are incredible, and he regulates how much food he ought to put in his mouth all on his own. After a quick swipe with the wash cloth, I ignore the messy booster chair and release e.e. to play while I finish my coffee. Normally he’s independent in the early mornings, and I read or stare into space while he explores within my peripheral vision. But I follow his lead: if he needs cuddles, we snuggle, sing, and read books until he crawls away, ready to explore. I am a huge, huge advocate of babies playing independently, for their sake and for parents’ sanity. The paradoxical way of infant independence is connecting when baby wants to connect so that he feels attached and satisfied enough to go explore. I never demand that e.e. play by himself; I just connect when he wants to chat or snuggle, and I don’t interrupt him when he’s doing his own thing. For some reason, he needs more cuddles after this morning nap. We read one of the library board books obsessively curated for maximum social awareness and diversity. We sing some songs. I bounce him on my knee. I’m likely still not dressed at this point. He goes back to sleep two hours after his morning nap and sleeps for an hour, waking up when Daddy comes home for lunch. 95% of the time I’m dressed (unless I’m really involved in a blog post), so we play outside or take a walk to a park. Ideally, I want him to get some outdoor time every day. Practically, I get fed up with digging dirt, leaves, and wood chips out of his mouth and sometimes we come in early. I love our outdoor time, though. It’s fun to see the world through his wondering eyes, and there’s no pressure to be active or exercise. I just sit and think (or not think). It’s done a world of good for my mental health and creativity. Two and a half hours after his late morning nap, he goes to sleep again. My mother- or grandmother-in-law watches him for an hour while I go to work at my preschool for a couple hours, and then Erich comes home. e.e. reportedly sits up all excited when he hears the door open. He adores his daddy. I get off around 6:15 PM and come home to a baby eager for snuggles and boobies. We’ll go outside again, maybe eat dinner if our lives are put together enough, or hang out in our apartment. When 7 PM rolls around, we go through our quick bedtime routine: pjs (sometimes), a lullaby, and our goodnight ritual borrowed from my granddad and punctuated by lots of kisses: “Good night! Sleep tight! Don’t let the bed bugs bite. Scrambo! Hasta mañana! I love you!” Then I kiss his cheek with his bunny lovey: “Here’s lovey!” And then I’ll kiss his cheek with his puppy lovey: “Here’s other lovey!” Then I’ll blow him one last kiss (unless I lose all self-control and smooch his chunky cheeks again) and close the door. Unless he’s overtired (in which case he might cry for 5-10 minutes — getting off schedule makes a gigantic difference! ), he’ll babble to himself before drifting off to sleep until around 6 AM the next morning. See? Motherhood isn’t all chaos. I wish my sleep-deprived newborn mom self could have seen this coming — these lazy mornings and those rested nights, and this giggly, snuggly, adventurous eight-month-old.